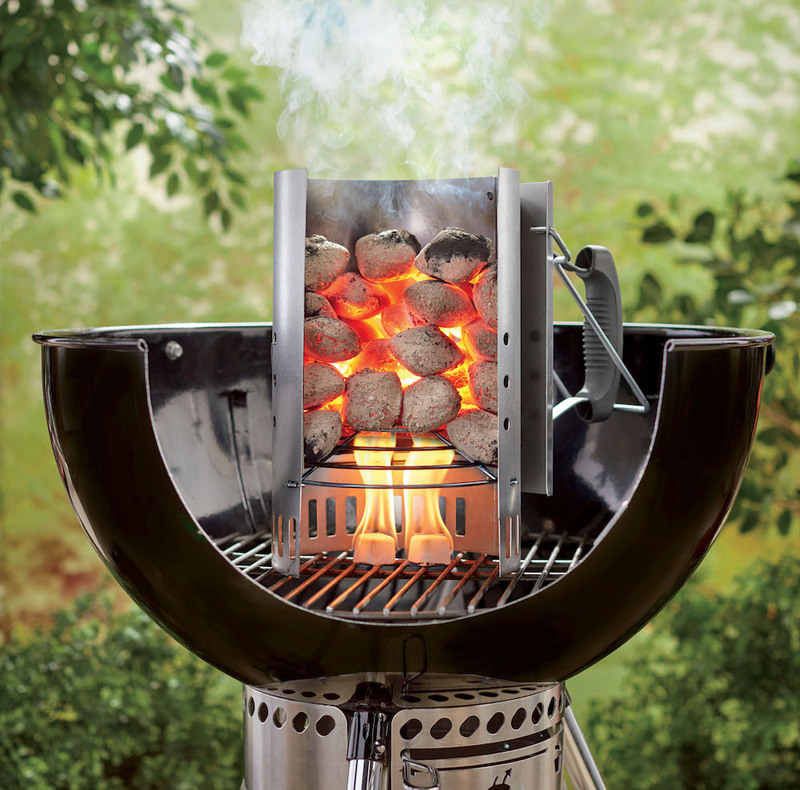 If you have a charcoal grill or smoker, then a chimney starter is a must have. The chimney starter is the easiest and fastest method for lighted any kind of charcoal. Getting started is really easy! Now, let's fire up the chimney starter. Open the damper fully on the lid of your grill and place the lid on the side of the bowl (using the lid hook located on inside of the lid) or place in the Tuck-Away lid holder if the grill has that feature. Empty any ash in the bottom of the bowl into the ash catcher by sliding the One-Touch cleaning system from side to side, sweeping the ashes through the bottom vents. Slide the damper blades on the bottom of bowl to the fully open position. Fill the chimney starter according to your grilling needs (see chart below). Place two lighter cubes on the charcoal grate and then place a chimney starter over the lighter cubes and ignite through the holes in the bottom. Depending on weather conditions, in about 15 minutes the coals should be sufficiently lit to pour into the grill. You’ll know the coals are ready when the ones on top have started to turn a bit gray with ash. When the briquettes are lightly covered with ash, put on two insulated barbecue mitts and grab hold of the two handles on the chimney starter. The swinging handle is there to help you lift the chimney starter and safely aim the coals just where you want them. Once the burning coals have been arranged (indirect or direct), set the cooking grate back into place, and put the lid on. It should take about 15 minutes to reach 500 ̊ to 550 ̊F, at which point the grill is considered pre-heated. Adjust your lid and bowl dampers to achieve the cooking temperature you desire. Note: Remember to put the chimney starter somewhere safe once you’ve poured the coals into the grill, you don’t want pets or guests bumping into it while it’s still hot. Always check to ensure the chimney starter is completely empty. 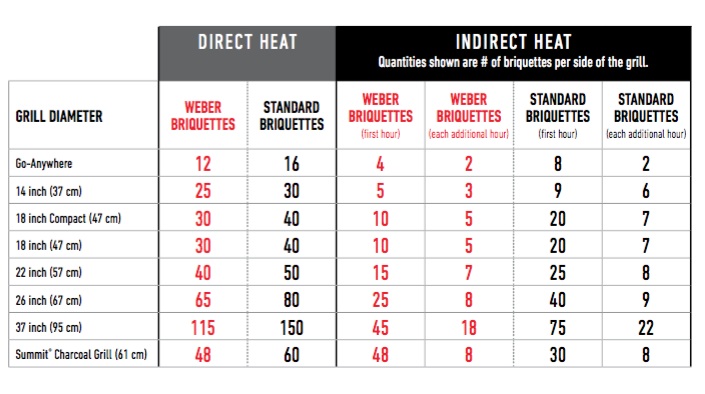 Follow this chart to see how much charcoal to add to your chimney starter.